This sculpture is part of my touring exhibit, Big Leagues Little Bricks, celebrating the beauty and lore of baseball as a part of Americana. The show is on display at the Louisville Slugger Museum now through September 2013. A main feature of this show is a series of figures each in a unique extreme pose indicative to baseball, showcasing the almost dance-like qualities of the sport. This figure is a pitcher, twisted up like a flamingo about to throw a pitch. The sculpture is half-life size (about 3 feet tall). 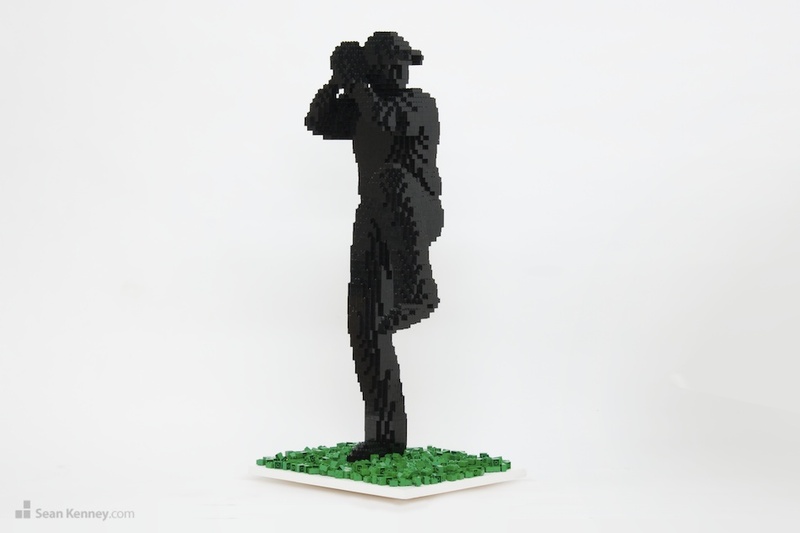 Each of these sculptures in the series is built entirely with black LEGO pieces; black doesn't read very well because of shadows, and when you look at them in person they almost look 2-dimensional, like a silhouette. So you could focus on the figures' poses I intentionally left them featureless (like a mannequin). As you walk around them, the silhouettes change, and the figures look like they're really moving. 12" x 14" x 35"